The Leftists running the Durham City Council are really out-doing themselves recently between their rampant anti-semitism and assault on Free Speech. And Mayor-Pro Tem Jillian Johnson is leading the charge. For starters, the Durham City Council apparently had issues with Jewish people. In June, members of the Durham City Council decided that their police officers should not accept the offer of training with/from anyone from the Israeli Defense Forces or the Israel Police. 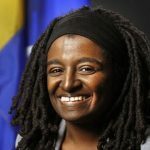 The Durham City Council members, led by radical Jillian Johnson, banned such training and any future exchanges between the Durham Police and Israel. For those paying attention, Johnson spearheading anti-cop and anti-Israel activities is not a shock. She is, after all, a Black Lives Matter organizer. With this action, Durham’s council members have the ugly distinction of being the first city council in the nation to do so. The Durham Council’s decision was also influenced by one of the most vocal anti-Israel groups which masquerade as a pro-Jewish organization called Jewish Voice For Peace (JVP) and their offshoot, Demilitarize from Durham2Palestine. Both are Boycott, Divestment, and Sanctions or “BDS” organizations and JVP’s BDS allies also piled on. JVP was very happy the council went their way and employed the same slogan (#DoItLikeDurham) used to urge more property destruction of statues as was used by the group Communists who destroyed a statue in Durham last year. I highly recommend reading this three-part series by Peter Reitzes which chronicles the entire affair. Then there’s Durham City Council’s Free Speech problem. Apparently, destroying public property and seemingly attempting to incite a riot in Durham are considered approved speech by this council. Apparently, @ProTemJillianJ issued a lengthy Facebook post wherein she simultaneously says she believes in free speech and yet some speech should not have a platform. There is quite a bit more in the above series of tweets. Go read the whole thread. Someone like Dr. Jordan Peterson, who does not subscribe to the realm of virtue signaling or political correctness, is not being accorded the same consideration. In short, the Durham City Council is trying to de-platform Peterson. For Durham City Councilwoman Johnson, Peterson, for lack of a better summary, is engaging in wrong-think. This is not shocking given her long radical history and what a raging far-Left Socialist she is. By the way, as if having her as a City Council member isn’t bad enough, Johnson is currently the Mayor-Pro Tem of Durham. It also appears she’s wiped her @Jillian4Council Twitter account. That’s a violation of public records laws, I believe. Johnson posted a lengthy message to Facebook condemning Peterson and the Durham Performing Arts Center for “inviting” him to use their venue for his upcoming event. The message was signed by all seven members and a full copy is available at the bottom of this article. The message ends with a call for his event to be ‘rejected’ which means this is a call for a protest. This message Johnson and the other members approved and then circulated on social media is a fine illustration of just how off the rails this council is. The irony here is that the Durham City Council is engaging in the very behavior Peterson rejects and often deconstructs with surgical precision. In fact, he surgically deconstructed their message. Dr. Peterson begins first by correcting Johnson and the council on the lie they told about the event itself. “The lie? The Durham Performing Arts Center did not invite me. I rented the theater,” wrote Peterson. After clearing up the fact the Durham Council is lying, he then sets about dismantling the key passages that jam-packed with virtue signaling and blanket assumptions. His closing paragraph was the best part, though. Everything that is reprehensible about the radical and ideologically-possessed left – all the moral self-righteousness, the platitudes, the clichés, the mindless celebration of diversity for the sake of the demonstration of tolerance, the naivete, and the appalling malevolence of casual denunciation – is on painful display in this missive. Exposure to such a piece of writing left me with a strong desire for a hot shower accompanied by plenty of soap and a scrub brush. We recently learned from coverage in the Indyweek that the Durham Performing Arts Center (DPAC) has invited Jordan Peterson to speak in the venue this September. Though the DPAC is owned by the City of Durham, the theater’s management companies, Nederlander & PFM, are entirely responsible for the choice of shows and performers who appear at the venue. We would like to be clear that we respect Mr. Peterson’s right to hold his opinions and to freely state his opinions without government interference. However, we wish to emphasize that a person’s right to free speech does not include the right to a platform or an audience. As many in our community have been disturbed and angered by Mr. Peterson’s racist, misogynist, and transphobic views, we would like to use this opportunity to reiterate our commitments and values to all of you as your elected representatives. We believe that Durham is a place for all of us – black, white, Asian, Latinx, indigenous, and mixed-race, trans and cis, gay and lesbian, queer, and straight, disabled and able-bodied, young and elderly, women, men, and non-binary, native and immigrant, secular and people of faith. Those who seek to exclude or deny the humanity of others will find no comfort here. We believe that everyone in our city should have the opportunity to thrive in an equitable and inclusive community. We understand that this opportunity has been intentionally and unjustly denied to many of our residents on the basis of race, class, gender, and other aspects of their identities. We are committed to taking action to remedy these injustices. We honor single parents, non-nuclear families, gay, lesbian, and queer families, and chosen families who are building lives full of love and support for each other and for the children in our community. We believe that all types of families raise healthy children who are prepared to succeed and make a positive contribution to the world. We believe that men and women are equally competent leaders and thinkers and that women should be in leadership roles in our community. We believe that violence against women is horrific and unacceptable under any circumstances. Women do not owe anyone access to or any level of control over their bodies or sexuality. We honor trans and non-binary residents and believe that respecting each other requires a commitment to using the names and pronouns that each of us identifies with. We will do all that we can to ensure that trans and non-binary people feel safe and respected in our community. We invite the Durham community to recommit ourselves to these values as a city and a community and to reject and resist bigotry wherever we encounter it. This entry was posted in LL1885, Outrage Industry, POLITICS NC, Poltical Correctness, Shutuppery, THE LEFT and tagged Dr. Jordan Peterson, Durham City Council, Jillian Johnson. Bookmark the permalink. The Durham City Council is an embarrassment to most educated North Carolinians. Nice overview and analysis. And, yup, watch out for ideologues. These two sentences, right next to each other, are stunning in their obvious contradiction and, frankly, lack of grasp on reality. “We would like to be clear that we respect Mr. Peterson’s right to hold his opinions and to freely state his opinions without government interference. However, we wish to emphasize that a person’s right to free speech does not include the right to a platform or an audience.” We are the government and acknowledge your right to speak without us interfering, but we are going to interfere and thus deny you that right. They also talk about not being entitled to an audience. Are they supplying the audience and now wish to withdraw it? Are they planning to deny the paying members of that audience the right to the free market, to enter into contracts for the exchange of money for services? What about Mr Peterson’s contractual rights to the venue he paid for? The virtue semaphore of their missive would wear out any navy signalman.